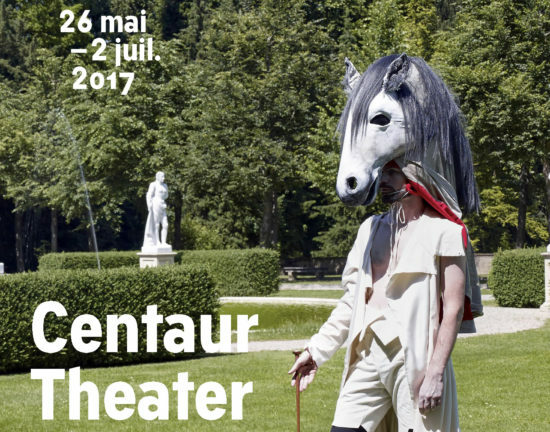 Gwen van den Eijnde (Assistant Professor, Apparel Design) will be showing his new film, Centaur Theater, as part of an exhibition of the same name at the Haute école des arts du Rhin (5 rue de la Manufacture des Tabacs, Strasbourg) with an opening reception and viewing on Thursday, 25th May 2017 starting at 6:30PM in La Chaufferie. This exhibition is a development of Van Den Eijnde’s recent work as a creator and performer in the Lipizzano Project, which was recently shown at the Villa Wenkenhof (Basel) in June 2016. Van Den Eijnde is an artist acting in a multidisciplinary universe that focuses on the intersection between theater and the world of visual media, which references the cinema of Peter Greenaway, Derek Jarman, and Sergei Papadjanov amongst others. The film consists of many different elements of narrative imagery that are fantastical or even mythological. The exhibition includes the film produced at the Villa Wenkenhof with Marcel Wehn and accompanied by the original soundtrack composed by Jae-Ho Youn, a series of photographs, and costumes.